When it comes to influenza, the shelf life of conventional wisdom can sometimes be remarkably short. Many things we thought we knew five, or ten years ago, we now find have either changed . . . or were never true to begin with. Hence we end up with unexpected discoveries, like finding H5N1 in Egyptian Donkeys, avian H3N8 in harbor seals, A novel Influenza D in cattle, or several never-before-seen subtypes of flu in bats. In 2004, equine H3N8 did something no one expected . . . it jumped to dogs at a racetrack in South Florida, and began spreading across North America. Halfway around the world, H5N1 was breaking the rules as well, infecting large cats in Thailand (see HPAI H5: Catch As Cats Can). A couple of years later, and we learned that an avian H3N2 virus - formerly detected in Korean poultry - had turned up in South Korean dogs (and later, cats), and was spreading across Asia (see Transmission of Avian Influenza Virus (H3N2) to Dogs). Since then we've seen other reports of avian H5N8 in Korean dogs, avian H6N1 in Taiwan's dog population, along with scattered reports of H5N1, H1N1, and just last Saturday - H3N8 - in Chinese dogs. The conventional wisdom of what constitutes the host range of influenza is constantly evolving, as is our understanding of how often host specific flu viruses jump species. 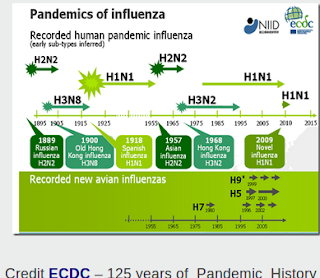 As we've discussed previously, we only know the types of influenza that have circulated in humans since early in the last century, but historic accounts suggest at least a dozen `influenza-like’ pandemics occurred in the 400 years prior to the 20th century. While we don't know the source of any of the other pandemics (or regional epidemics) going back several centuries, historical accounts have occasionally linked them to concurrent outbreaks in domesticated animals. In 2010 the NIH tag team flu experts David Morens and Jeffrey K. Taubenberger penned a fascinating account of the 1872 equine epizootic - an epidemic in horses that spread from Canada to Mexico in a matter of months - and brought transportation to a standstill in this country. Without horses, business slammed to a halt; the mail didn’t run, groceries didn’t reach the cities, crops weren’t harvested or transported. After a few weeks, most of the horses recovered and business followed, but the epizootic swept across the country (intensely tracked by the newspapers of the day, warning each city in turn that it was going to be attacked), finally fizzling out the following summer in British Columbia. In A New Look At The Panzootic Of 1872 we looked at Morens and Taubenberger tantalizing review of anecdotal reports of a concurrent epizootic affecting poultry, and even causing human illness across the nation. Major US influenza epidemics were documented in 1873 and 1874,5 but it is not clear that they were related to the 1872 panzootic. The panzootic proceeded explosively and extinguished rapidly, but smaller outbreaks recurred in some locales in late winter and early spring 1872–1873, and episodically in years thereafter.1,2 Major national epizootics of equine influenza recurred in 1880–1881, 1900–1901, and 1915–1916,4 but avian epizootics were not to our knowledge associated with them. Among scientists, there exist mixed opinions whether equine influenza viruses infect man. In this report, we summarize a 2016 systematic and comprehensive review of the English, Chinese, and Mongolian scientific literature regarding evidence for equine influenza virus infections in man. Searches of PubMed, Web of Knowledge, ProQuest, CNKI, Chongqing VIP Database, Wanfang Data and MongolMed yielded 2831 articles, of which 16 met the inclusion criteria for this review. Considering these 16 publications, there was considerable experimental and observational evidence that at least H3N8 equine influenza viruses have occasionally infected man. In this review we summarize the most salient scientific reports. In this review we found considerable historical evidence of EIV infections in man. Although they are careful to explain confounders, Morens and Taubenberger  document numerous such historical observations. They found that from 1658 to the early 20th century, EIV outbreaks in horses often occurred 3 weeks or so before human influenza-like-illnesses (ILIs). In particular, scholars have implicated the 1889 human pandemic as likely caused by a H3N8 EIV [25,26,27]. Serological studies, published in the 1960s, of people who lived during that 1892 era, are most compelling in documenting elevated antibodies against H3N8 EIV [14,17]. The historical, observational, and experimental data are compelling in supporting the premise that EIV infections occasionally occur in man. 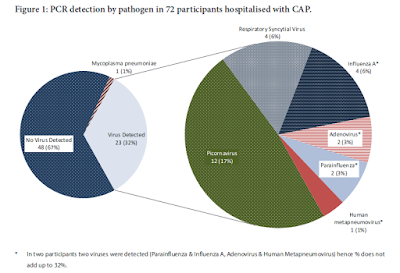 While in recent years, human infections with EIVs have not often been associated with signs of infection, the propensity for influenza A viruses to change makes these viruses worthy of our attention. In particular, should H7N7 EIV strains again emerge, most humans would have little cross-reacting antibody, and the threat to humans might be quite different than that commonly seen today for H3N8. We believe these observations support close surveillance for novel influenza virus emergence among equids. While the evidence for human infection by equine influenza is limited, this is nonetheless a fascinating report, and well worth reading in its entirety. The bigger takeaway is that every month we see new studies showing the host range, circulation, and evolution of influenza viruses is far greater and more dynamic than we could have imagined even a few short years ago. Most, admittedly, will never prove a serious human health threat. But for the first time in history we have the potential to see the next pandemic coming - perhaps in time to do something about it - rather than being blindsided as we always have in the past. It's something to shoot for, anyway.